All the big brands, shopping malls and grocery stores have been waiting for it all year long (and so have we, right? ), it's THE Holiday! It's Christmas time! And so they play it BIG. And I am telling you, I’ve never seen anything like it. 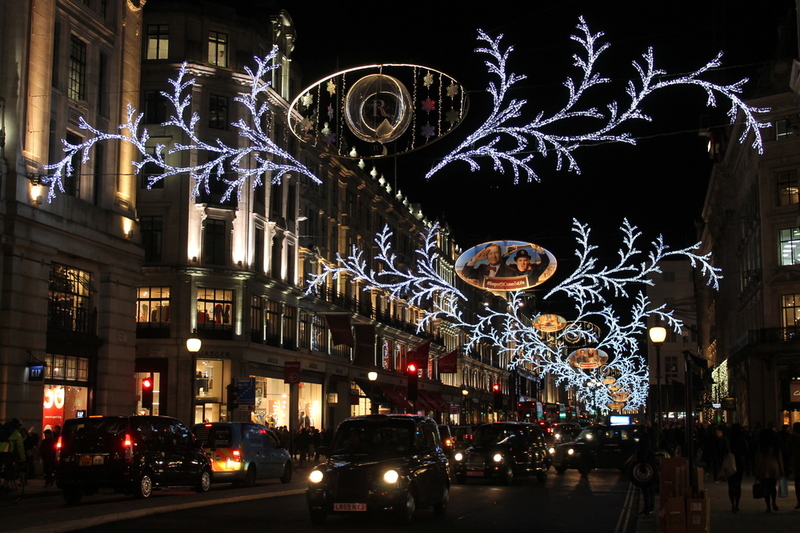 December is incredibly beautiful in the City, it's many Christmas lights everywhere and shopping offers at every corner. People are much happier and so are willing to overspend shopping for the loved ones. I particularly enjoy going from shop to shop checking what's out there and then making a final decision on what should I get. But I must admit that department stores like Liberty, Selfridges, Harrods or Fortnum & Mason are excellent ideas if you have a generous budget for your xmas shopping. Liberty is my favourite if what you are looking for is cute and original stationary or beautiful fabrics (the scarves section is particularly incredible), which is why they are known for. I must say I also like their beauty department. Although small, they have their own brand and a selection of other quality (and luxurious) brands like Diptyque or Le Labo candles and Kiehl cosmetics. Selfridges has to be my favourite fashion-wise. They've pretty much got everything you need. Starting from the bottom to the top, you'll find boutiques to high-street brands. And what's best, they've got a special customer service to help you do your Christmas shopping. If you are willing to spend about 350 or more in-store, you'll have a personal shopper to help you out or do the shopping for you (if you provide her with a list) and you'll have a chauffeur who will drive you home. HOW GOOD IS THAT?! Not to forget Harrods, the most classic of all. The quality of their products is undeniably good. But I think what makes me love Harrods more than anything is what it means, the image of it, how iconic the place is. 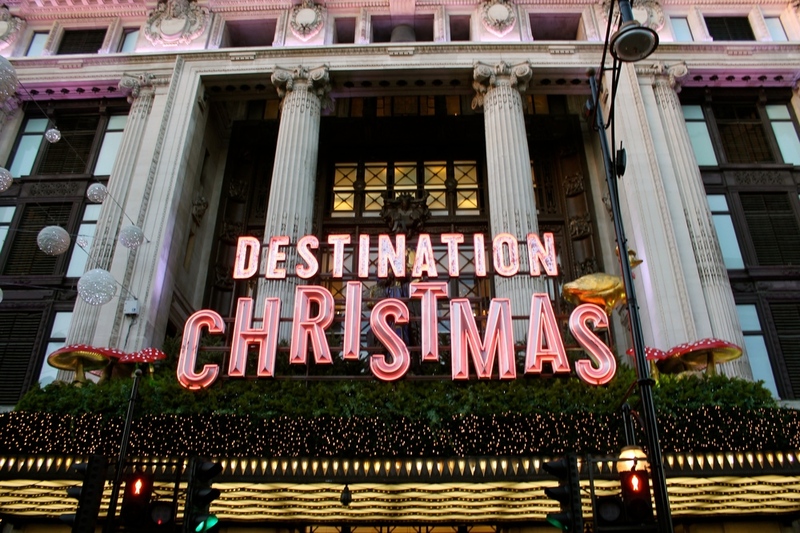 There's no other department store that has been so internationally recognised. And everybody enjoys receiving one of those green bags, don't we guys? Even when your budget is a bit more tight, just going to their Food Hall and getting some delicious sweets for the family is an excellent choice. Fortnum & Mason was a discovery to me when I moved to London. And I don't know what I would do without it now! Tea lovers, this is THE place. I couldn't believe there were so many choices for tea til I got here. And they are freaking delicious! And this coming from a coffee passionate has got to mean something. But not only you'll find an excellent tea selection, there's also afternoon tea treats, cakes, chocolates, macarons, even a supermarket! The department store is known for their infamous tea but they actually sell all sorts of things: from jewellery to homewear. They have even got a Christmas Market in-store! I've never seen anything like it in my entire life, it's like you are in another world. I guess what I am trying to say is that nevermind what I previously said, you should definitely have a look around these places, regardless of your budget. Because trust me, you'll be mesmerized.